Some of the fruits of our colleague’s 2015 tomato harvest, rinsed and ready for cooking and freezing. When it comes to growing tomatoes, it seems every gardener has an opinion about how to get the biggest and best harvest. A recent staff discussion focused on techniques for amending the soil prior to planting tomatoes. The idea is to give the plants all the nutrients they need to produce a bumper crop of tasty fruits, a practice that’s particularly important for gardeners whose plots are smaller in scale or whose properties make it difficult to rotate planting beds. Last year, one of our staff members did a good deal of poking around on the Web, which, while sometimes a hazardous pursuit, inspired her to try some traditional but more recently underused ideas. She decided to take a few chances with amendments that are more common to the kitchen waste bin or compost heap than the nearest big box store. The result? She enjoyed her highest yields ever on a varied crop of tomatoes that ran the gamut from cherries and paste tomatoes to slicers and beefsteaks. 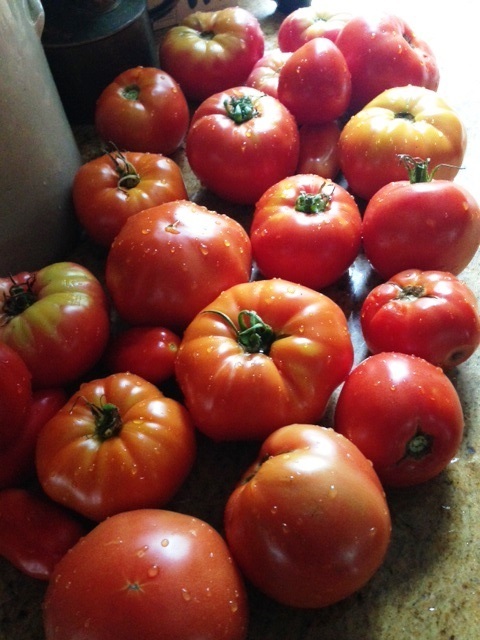 She feasted on salads, BLTs, gazpacho, and stuffed tomatoes all summer and still had plenty of beautiful, ripe fruits for making sauce and roasting tomato wedges with basil (for a bruschetta topping). She froze chopped tomatoes to use in soups and chili recipes, and froze tomato sauce, as well as the aforementioned bruschetta topping. (We’ll be running these recipes later in the season.) Needless to say, she made some of us a little jealous with her wintertime lunches. Determined to enjoy similar results and to share her rediscovered techniques with you, we ran her list of amendments by our nursery manager Barb Pierson, another champion tomato grower. Pierson applauded some of our adventurous colleague’s amendments but voiced concerns about others. What to do? We thought it best to set it all down, and let you make your own decisions based on circumstances in your own backyard. To begin amending the soil, start by digging holes about 15 inches deep (this is not your planting depth, but the space you’ll need for adding amendments). Fish heads, fish fillets from the supermarket freezer section, or a handful of fish and kelp meal help boost soil nutrients. 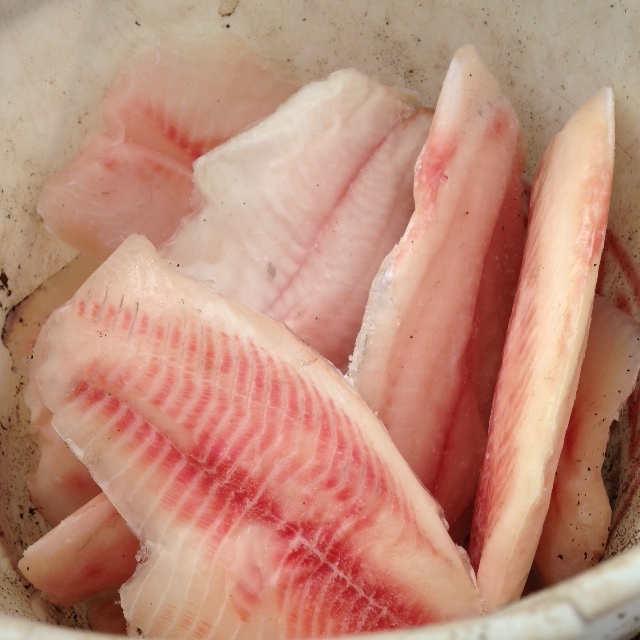 Fish heads (or frozen fish fillets, if you can’t get fish heads): Put 1 fish head or the equivalent in the bottom of each hole. You also can add a handful of fish and kelp meal to help boost the nutrients. As winter shows signs of coming to an end, we begin collecting eggshells. Just rinse them and keep them a bowl in the refrigerator or in a protected outdoor space. Before adding to the soil, crush them with a potato masher or with your hands. 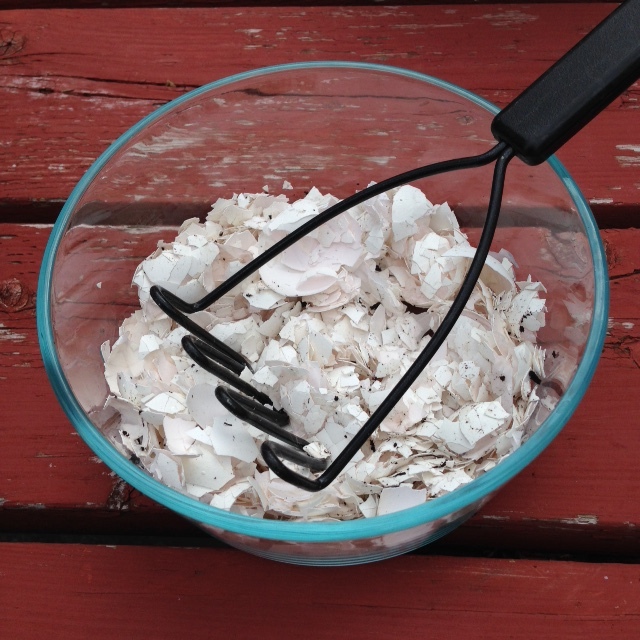 Crushed eggshells: These add calcium to prevent blossom end rot. Throw a couple of handfuls in each hole. Here we add a handful of bone meal. Bone meal: This promotes strong root growth and abundant blooms. Add a handful to each hole. Compost and composted manure are great additions to the soil for tomatoes and lots of other plants. 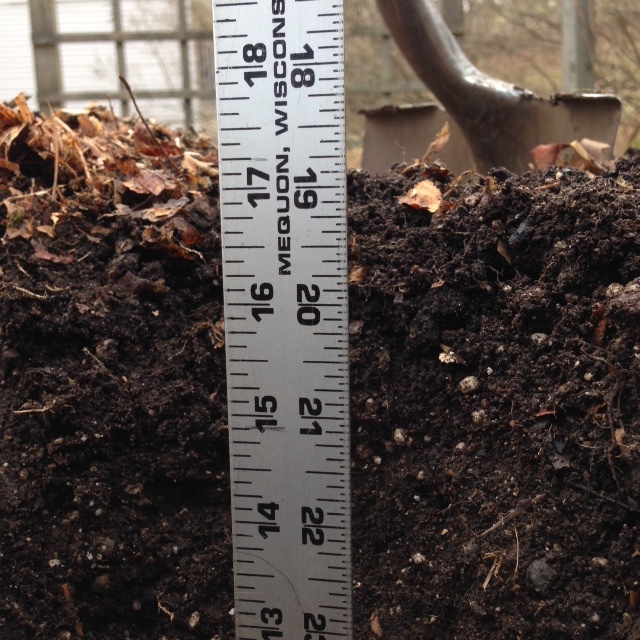 Compost adds basic nutrients and improves soil structure. Composted manure provides nutrients all season long. Composted manure: This provides a slow release of nutrients over the growing season. Add a couple of handfuls to each hole. 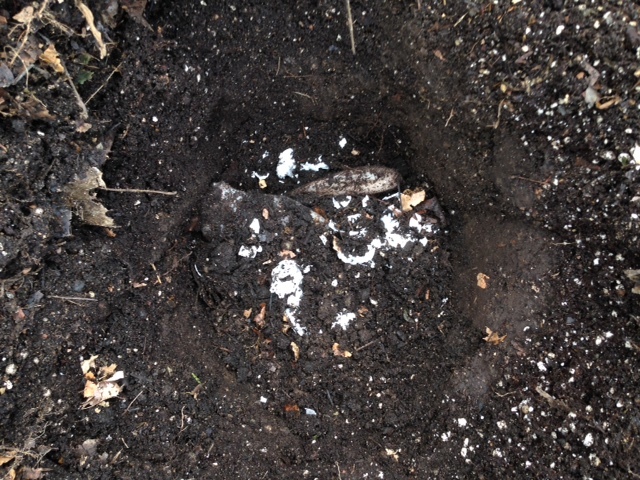 Compost: It will add basic nutrients and improve soil structure so the soil drains well yet retains some moisture. Add 2-3 handfuls in each hole. Combine all the ingredients, and mix! 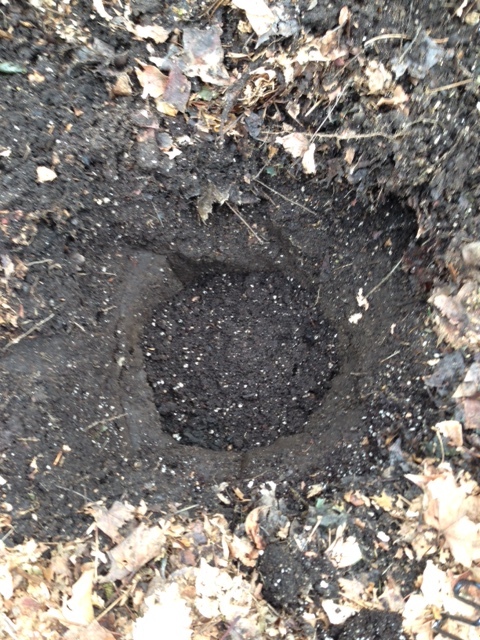 Please note that the 15” hole will be partially filled with the amendments, which should then be partially buried by some of the soil in your garden (think of the hole as a big mixing bowl). This process of amending can be done prior to planting your tomatoes when the soil temperature is still on the cool side. 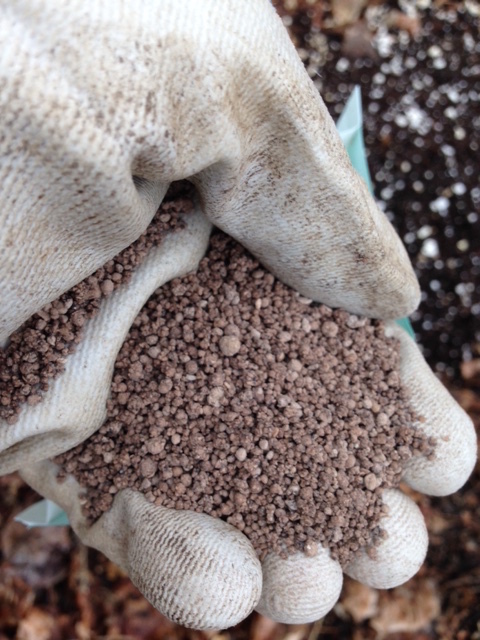 Pierson agrees that compost and eggshells add beneficial nutrients to the soil, but she isn’t sure the quantity of eggshells noted above would be enough to provide calcium throughout the season. Perhaps the thinking should be that that every little bit helps.